The subject of bronzes and brasses, and which to use for various marine applications, is one that comes up on a weekly basis on yachting forums. Here’s a short explanation of what they are and where they should be used. The excellent properties of copper-tin alloys have been known since – well, since the Bronze Age. Alloys of copper and tin, along with small amounts of other elements, have been used for thousands of years where strength, corrosion resistance, good appearance and ease of manufacture are important. Cast tin bronzes have been widely used in marine applications, perhaps the most widely known of these being gun-metal, although large numbers of fittings that are immersed in seawater continue to be made from this versatile material. Where strength is important, such as in bolting, it is common to use a slightly modified version, called Phosphor bronze. The one disadvantage of this versatile alloy is its cost. Tin has always been a high-priced metal, with the result that for more than 100 years there have been many attempts to find a cheaper alternative. Although originally gunmetal contained 10% of tin, modern ‘gunmetal’ standards BS 1400-LG2 and LG4 specify a tin content between 3 and 7%, with similar amounts of lead and zinc. It is increasingly rare to find tin bronze used in modern yacht fittings, although 25 years or more ago this was the material of choice for skin fittings, seacocks and suchlike. 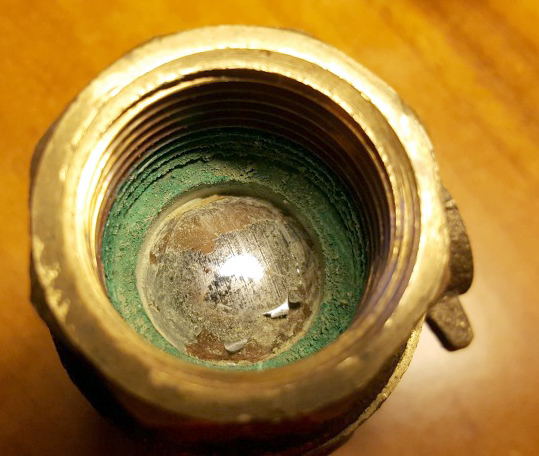 Beware that some bronze valves have been found to have chromium plated balls and stem fittings that are made from brass, although the body is bronze. A number of other bronzes are in common use for underwater purposes, including silicon bronze, aluminium bronze and nickel-aluminium bronze. Silicon bronze is perhaps the most common alloy for fastenings in modern wooden boat building thanks to its strength and corrosion resistance. ‘Bronze’ rigging screws may be made from either silicon or aluminium bronze. Aluminium and nickel-aluminium bronzes are widely used for ship’s propellers but the alloy seems to have fairly limited use for this purpose in yachting applications. Brass is also copper-based but there the similarity ends. Its main alloying element is zinc, at anything between 0 – 50%. Brass is widely used in marine duties, where its resistance to atmospheric corrosion is reasonable, provided that tarnishing is either accepted or taken care of by regular polishing. However, for underwater use the unmodified alloy is not acceptable. The most commonly used alloys are 70/30 (70% copper, 30% zinc) which is ductile and 60/40 (60% copper, 40% zinc) which is rather more brittle. 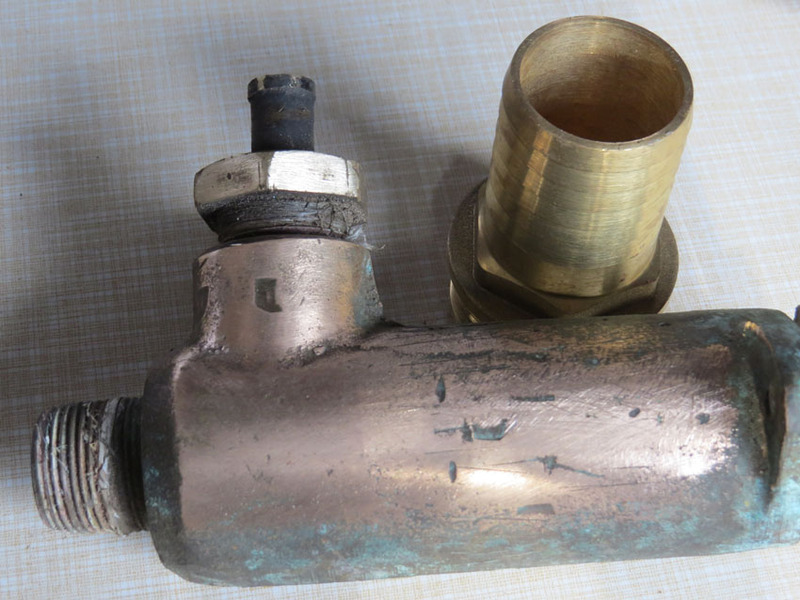 Typical duties for 70/30 brass are forgings, sheet, tubes and wires, whereas 60/40 is normally cast, for plumbing fittings and similar products. 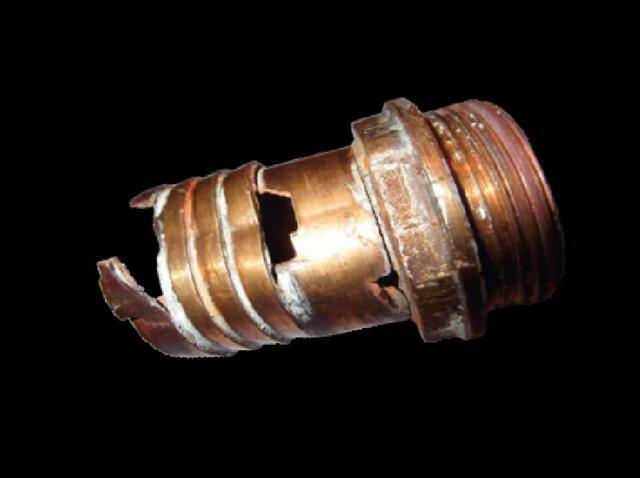 Since the 19th Century, many attempts have been made to improve the resistance of brass to seawater corrosion. Small additions of other metals have brought about significant improvements, although perhaps not quite as much as their names would suggest, for example neither Admiralty Bronze nor Manganese Bronze are bronzes at all, although Naval Brass is rather more modest in its claims. Naval Brass is sometimes sold under the standards MS56 (CuZn44Pb2, CZ130) or MS 58 (CuZn39Pb3, CZ121). 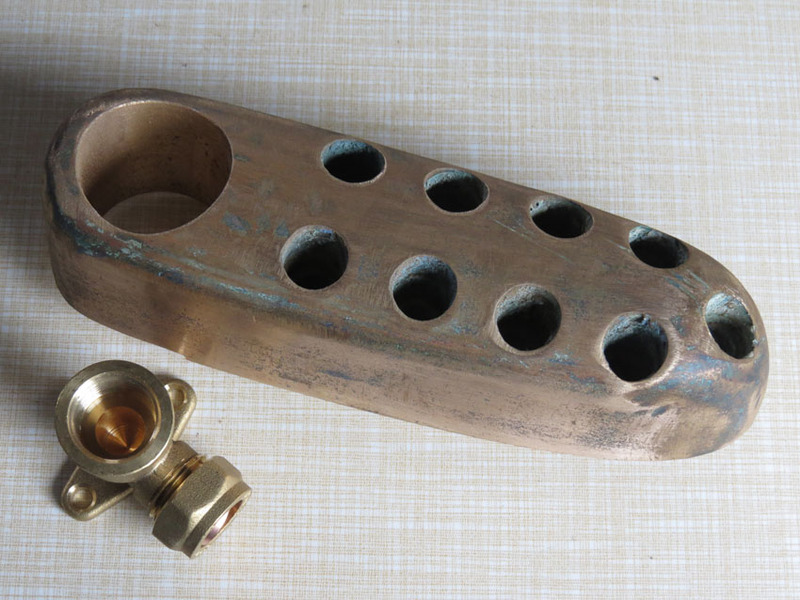 Very many yacht fittings are made from Manganese Bronze; propellers, P-brackets, skin fittings, being some examples. All of these modified brasses have been susceptible to a particular type of corrosion known as dezincification. When immersed in seawater there is a tendency for the zinc-rich phase in brass, and its modified versions, to be leached away, leaving the copper-rich phase behind. 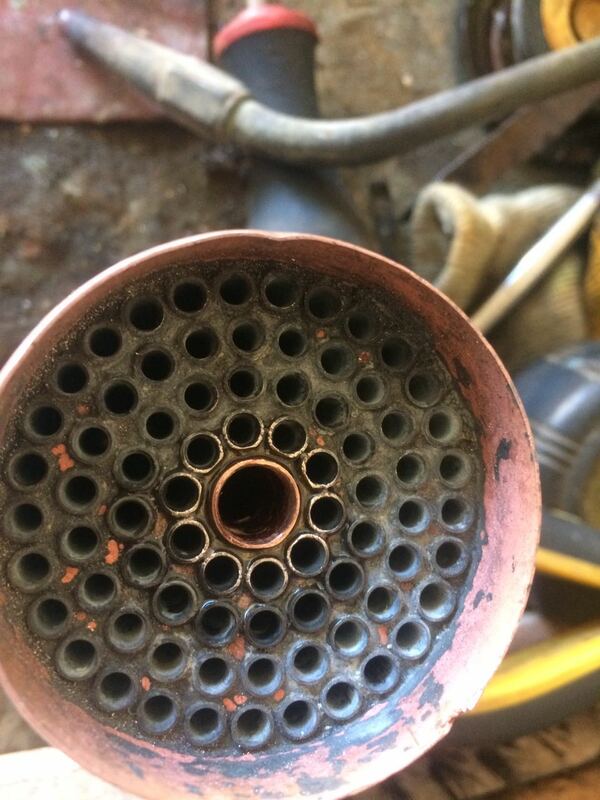 Copper has little strength, especially as loss of the zinc leaves it spongy, and the component will fail when this happens. In a well-known case a boat named the Random Harvest sunk when a skin fitting failed due to dezincification. However, the answer to the dezincification problem has been known for 50 years and DZR (dezincification resistant) brasses have been available for almost that length of time. DZR is a leaded brass with a small arsenic content. Its copper content is very carefully controlled, at about 63%. Over 63% brass is normally single alpha phase, so more malleable and used for forgings, etc. Below 63% is two-phase, mostly used for castings. In the case of DZR the copper level is such that components can be made by hot stamping but converted from duplex to alpha phase by subsequent heat treatment. Most good quality fittings are now made from DZR, Blakes seacocks being one example, giving them Lloyds approval for use in a marine environment. If buying underwater fittings and components from a chandlery you should insist that they are DZR, preferably with some form of certification. 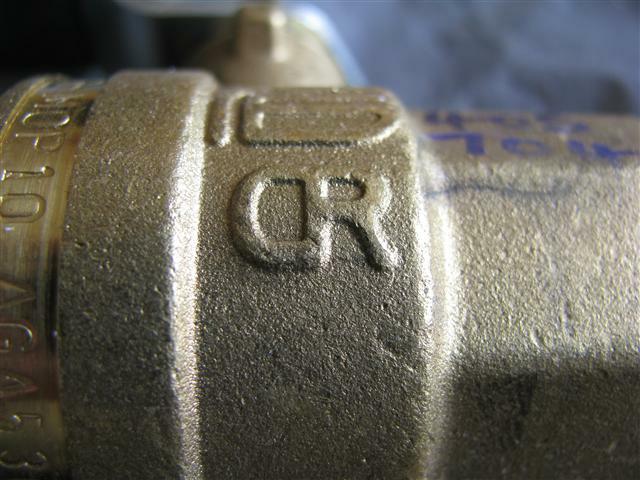 In 2013 skin fittings and hose tails marked with the CR logo became available. Dezincification in used components is fairly easy to see. After abrading away any surface paint and oxidised layers, inspect the bright surface for any sign of pinkness. If this is present you are looking at the copper that remains. The problem affects the surface first; so further abrasion may well remove the entire affected layer. 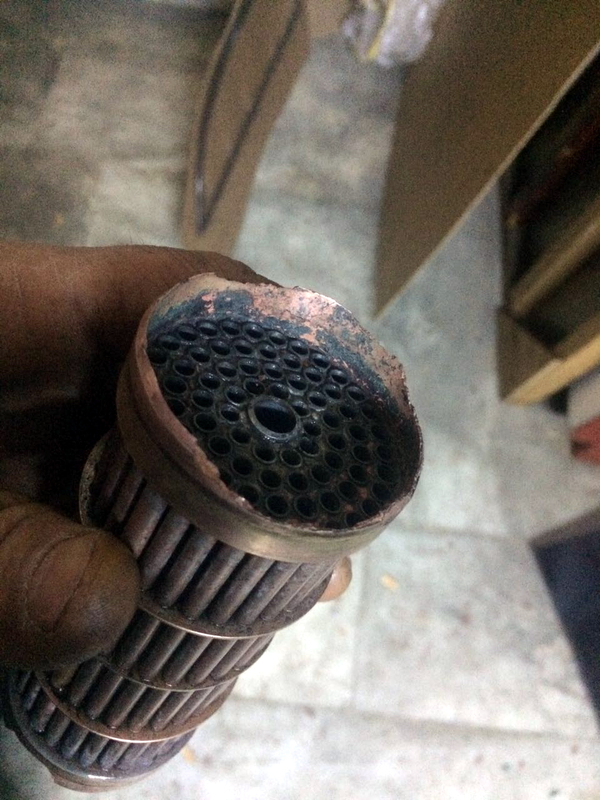 Although mainly seen on underwater components it also occurs on engine water pumps, where the cover is often made from 60/40 brass. The short answer is that there is no simple way. A spectrographic analysis is probably the cheapest way if you really need to know, the likely cost being £100 – 200. A good guide may be to consult Metalreference where composition can be estimated, based upon the colour of the alloy. 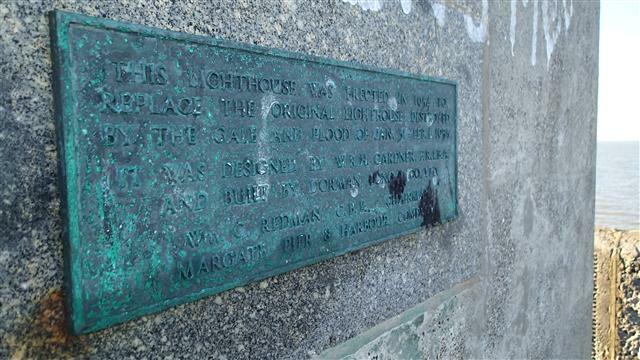 This bronze casting has been in situ in a marine environment for 60 years. 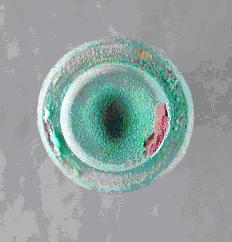 The colour of the verdigris corrosion product is typical for a bronze and is slightly darker than that on a brass, as seen on the valve actuator below. The table shows typical compositions of various copper alloys. Note that these can vary considerably and the table should not be considered definitive. For instance, Admiralty bronze is a 70/30 alloy with additions that may be either 1% tin or 2% aluminium plus a small amount of arsenic. There is even one grade of manganese bronze that does not contain manganese! 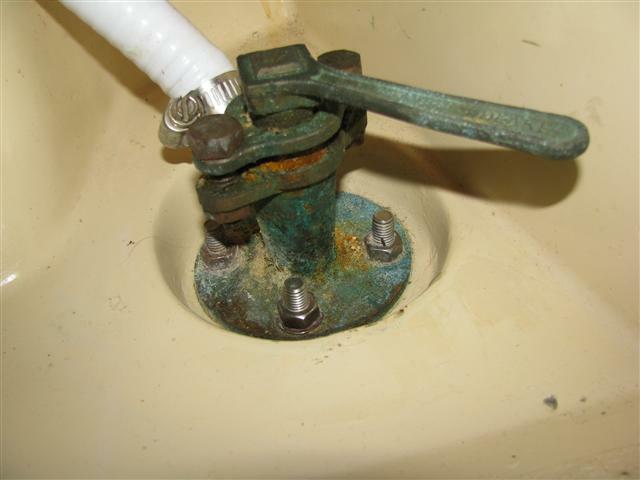 The lower fitting in the photograph is an elderly seawater strainer made in bronze. 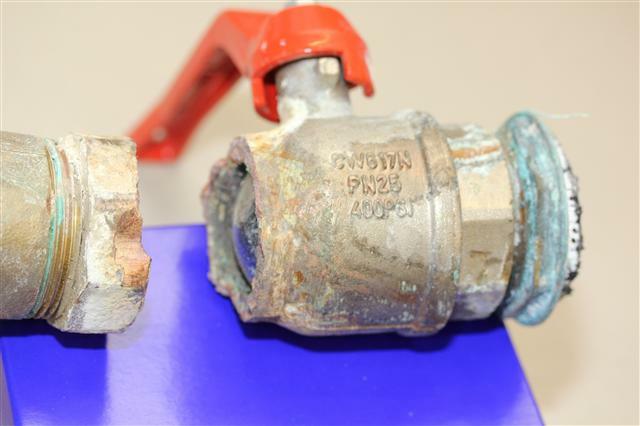 The hexagonal compression fitting is made of brass that looks bright as it has just been abraded and has some light reflecting off it. The 1.5 inch hose tail next to it is made of Tonval, a leaded 60/40 brass. The difference in colour is characteristic. Bronze is known in USA as ‘red brass’ thanks to this appearance. Another bronze item, a rudder shoe that has been attached to a skeg. Its colour is being compared with a standard plumbing fitting, made in 60/40 brass. 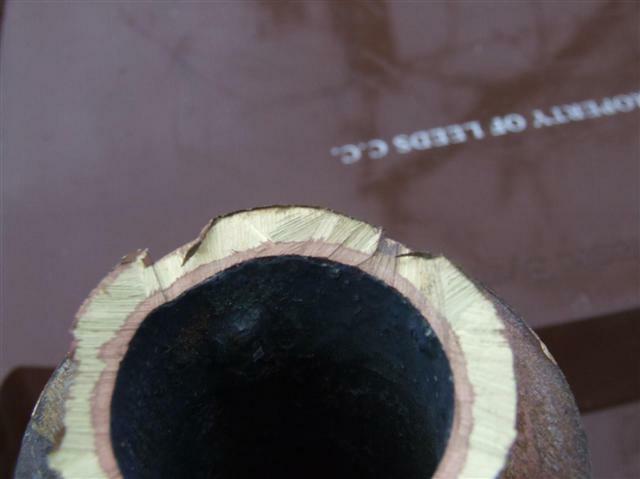 The colour of every copper alloy is characteristic, enabling identification simply by inspection. 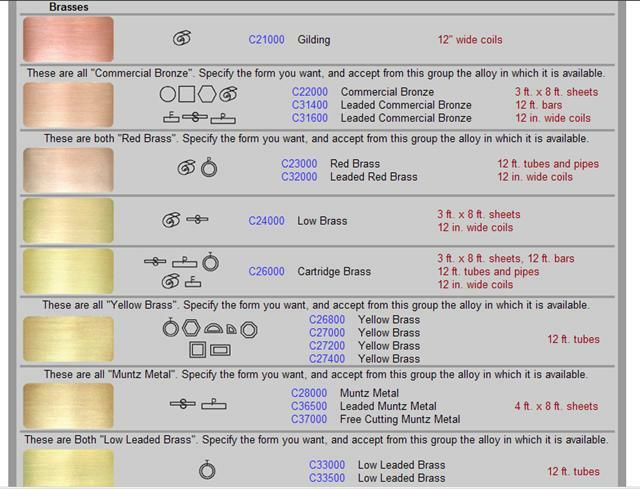 Perhaps the best guide to copper alloy composition without paying for analysis is to use the Metalreference website, which shows the colour of a large number of alloys for comparison with a sample. 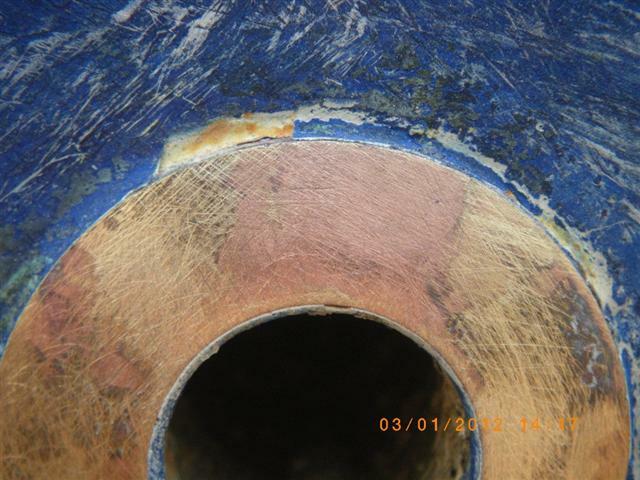 Removal of the antifouling paint reveals the surface of the skin fitting flange. The unmistakeable pinkness associated with dezincification can be seen. 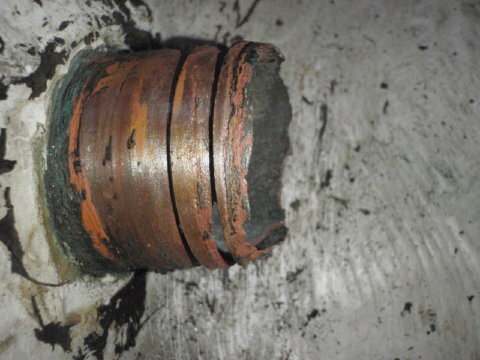 The photograph illustrates how dezincification has affected the part of the fitting exposed to seawater, invisible to external examination. The fitting has been installed for only five years. 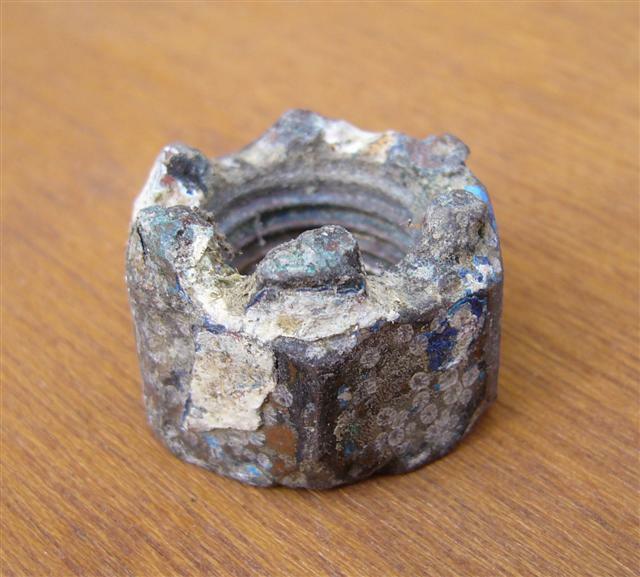 This manganese bronze castellated nut retained a propeller on a shaft. 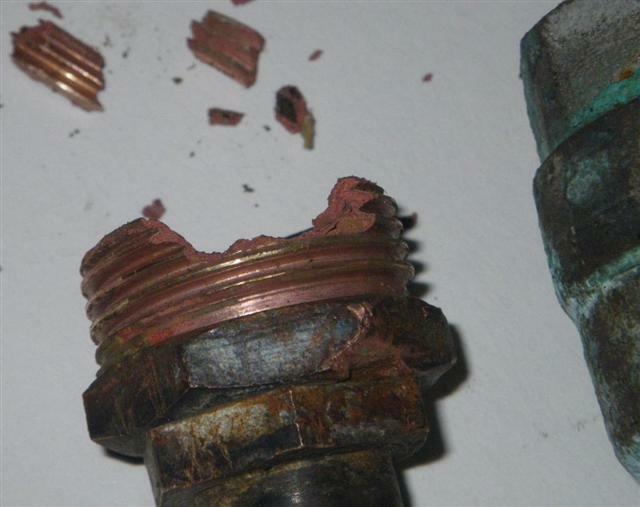 The castellations have suffered extensive corrosion after 15 years in service. 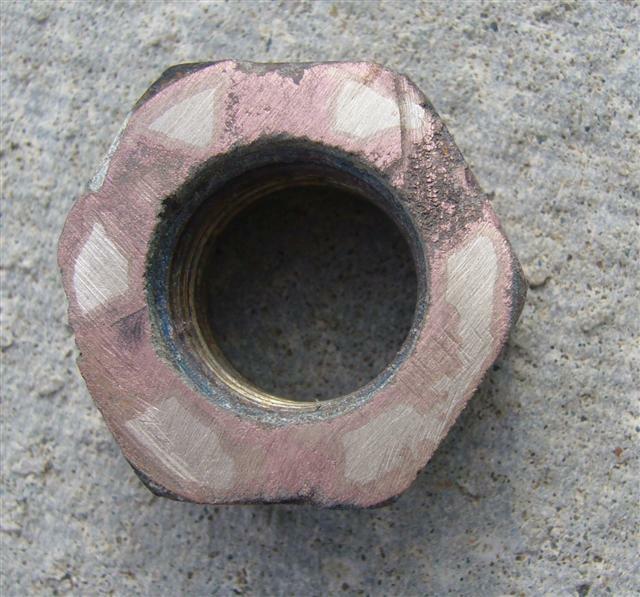 Filing off the top of the nut and all deposits reveals the pink colour of dezincification in the slots between each castellation and on the surface of each one. 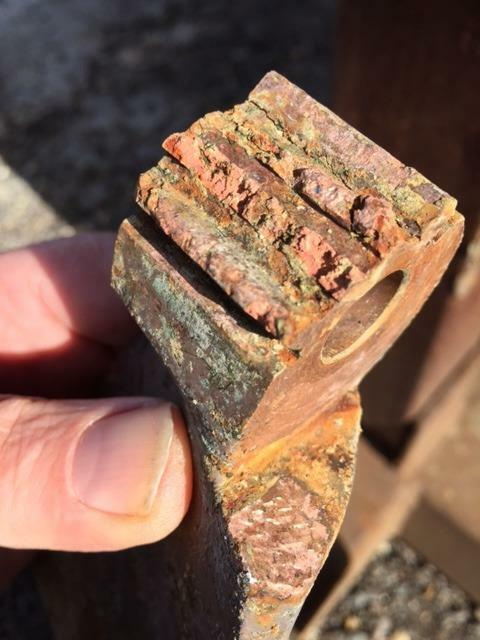 The pinkness occurs because after the zinc-rich phase has been corroded away the remaining metal is copper-rich, copper being red in colour. Many stern tubes are made from inappropriate materials. This one shows advanced dezincification that could conceivably cause loss of the boat within a relatively short time. 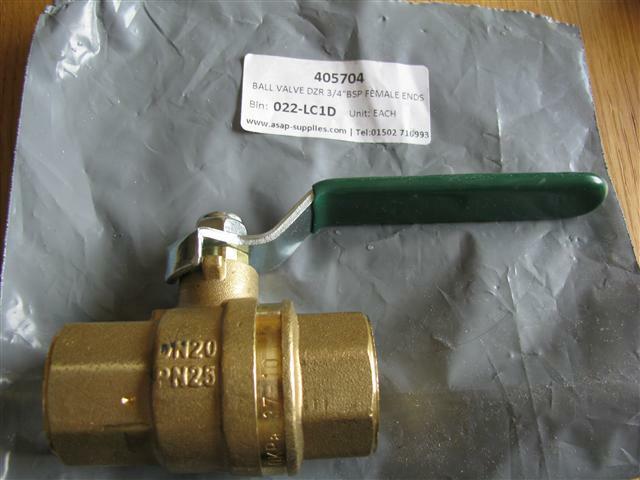 A genuine DZR ball valve. Note that it is not chromium plated, which is typical. The cast-in markings are the size, DN20, and the pressure rating, PN25. The ball appears to be electroless nickel plated and some experience suggests that it may be made from brass, unlike the valve body. The reverse side of the same valve. The CR marking stands for Corrosion Resistant and identifies the valve as made from DZR. A 25 year old Blakes 3/4 inch seacock. Until about that age Blakes made these from gunmetal but since then they have been DZR. 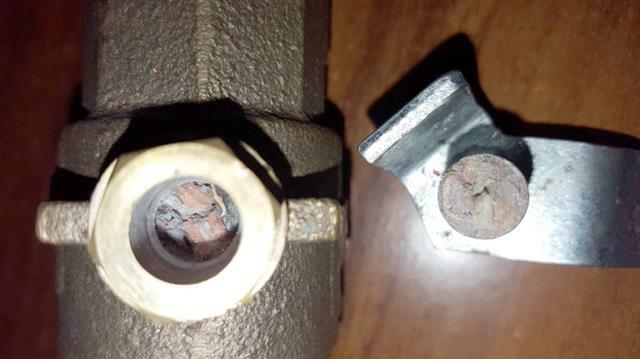 Other than a little rust from the steel bolts and a little surface corrosion the valve remains in perfect condition. Recently I needed to re-grease a 1.5 inch version of this seacock with the boat afloat. I found it to be a very simple procedure, allowing less water into the boat than removing the log impeller. One of the standard wooden plugs sold at every chandlery is a good fit for the tapered housing. I simply loosened and removed the yoke bolts, pulled out the rotating part with the handle and substituted the wooden plug. I greased as necessary and replaced it after removing the wooden plug. No more than a litre of water in total entered the boat. Although beautifully installed, these valves supplying the heads of a nearly new, high quality yacht are almost certainly made of brass. DZR brass and bronze are not chrome plated to our knowledge. It is likely, from further correspondence, that the skin fittings and hose tails are also made from brass. The response of the manufacturer, in common with that of many others, is that they have had no problems reported to them. Photo: name withheld by request. The materials specification of this valve is clearly marked on its body – CW617N. The specification is for a leaded 60/40 brass, an alloy unsuitable for underwater use. It had been installed in a ‘quality’ yacht by a well-known builder. It may be unintentional that the cast RG identifier on the elbow looks like the CR marking of DZR. In fact it shows the maker, Guidi. Another CW617N valve, this time fitted as part of a subsea system on a Malo 40. Det Norske Veritas (DNV) Rules for Classification of Ships state: Couplings having zinc content greater than 30% are not approved for seawater systems. Wikepedia says: Tonval brass (also called CW617N or CZ122 or OT58) is a copper-lead-zinc alloy. It is not recommended for seawater use, being susceptible to dezincification. A very badly dezincified hosetail that fractured when tapped lightly. Note that the colour change is not evident on the outside, where seawater has not been in contact with the metal. 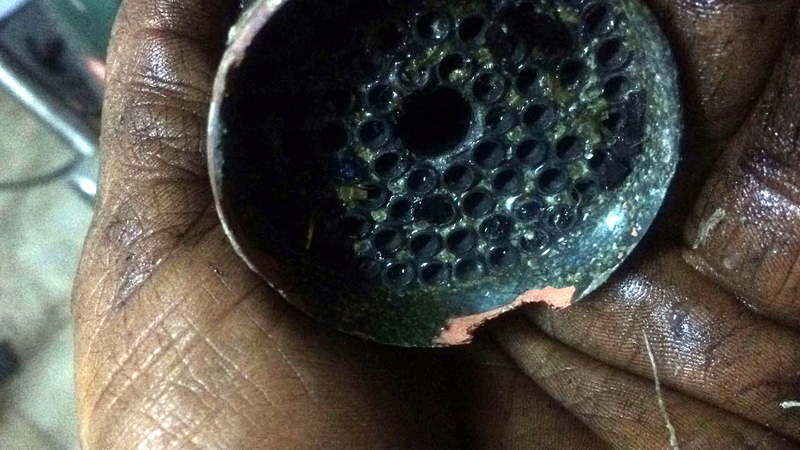 This is one of the failed fittings that initiated the Yachting Monthly campaign. A severely dezincified hose tail on a Dufour yacht. In a long correspondence this company insisted that all subsea valves and fittings installed in their yachts were made from DZR brass. 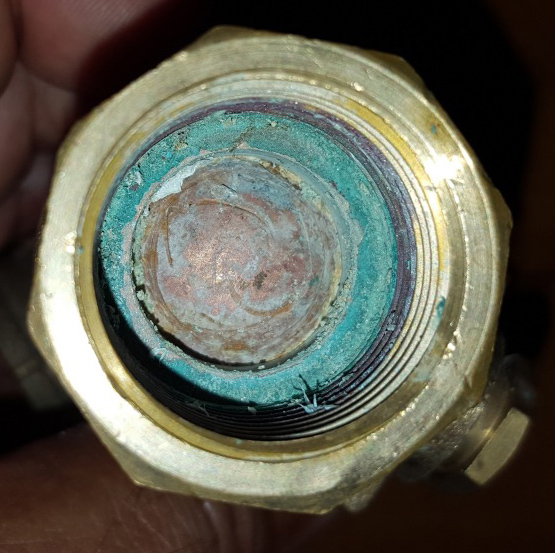 This hosetail has clearly suffered severe corrosion and the valve is chromium plated, so unlikely to be DZR. 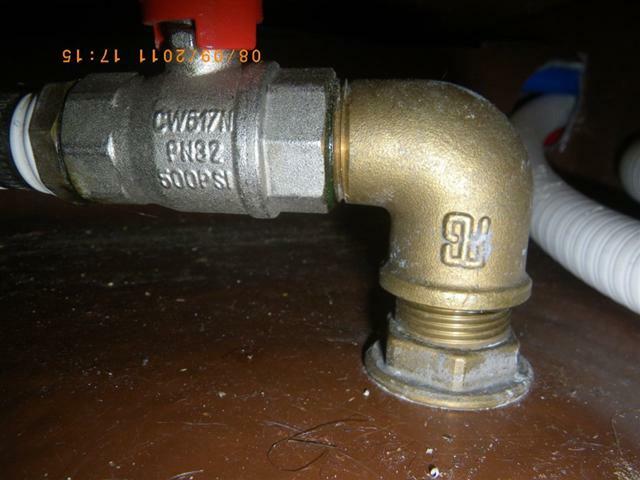 Later the company claimed that skin fittings were DZR, not the valves. Hose tails were not mentioned. 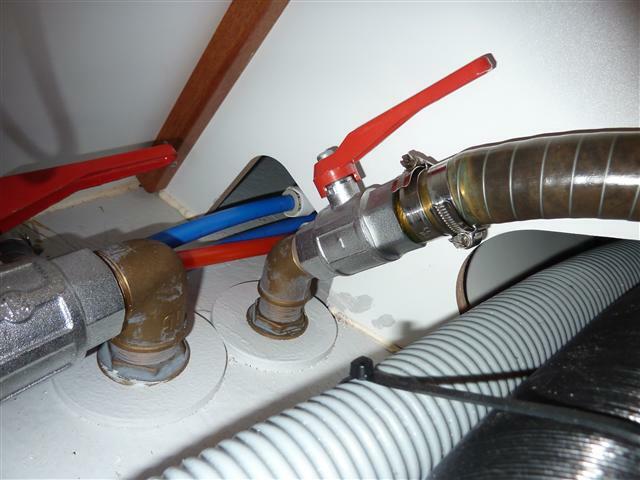 A spectacular example of advanced dezincification in a hose tail taken from a Jeanneau. The whole of the threaded region displays the red colour of the copper phase and its brittleness is evident. 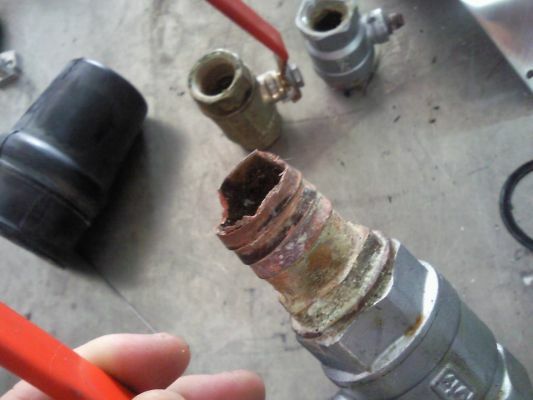 The valve material cannot be blamed in this instance! The boat was wintered ashore with the seacocks closed. 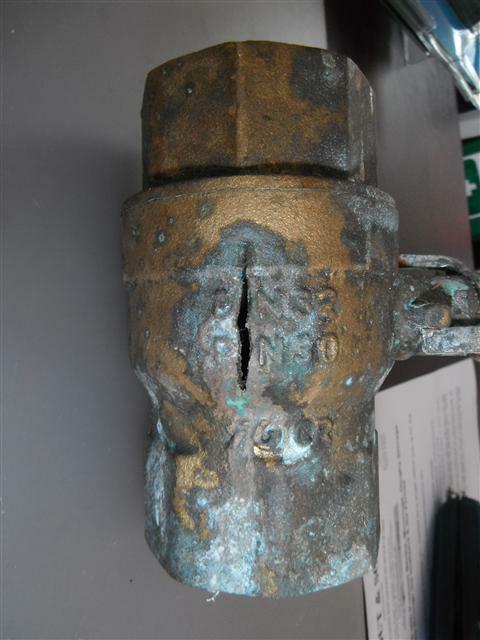 Water contained in the valve froze, fracturing the body. Dezincified folding propeller blade. The blade appears to be manufactured in manganese bronze, a modified form of brass. Over time the zinc-rich beta phase is lost, leaving the copper rich alpha phase that has little strength. The teeth crumble away and the gear mesh of the blades is lost. The ball in valves is plated, either with chromium or nickel, to provide low friction and corrosion protection. The ball is often brass, even in bronze valves, and can corrode in seawater. The consequence can be that operating the valve becomes increasingly difficult due to the additional friction. It can also be the case that the stem is also made from brass, weakening due to dezincification. In due course the stem can fracture, in any position. In this case the valve as closed but my own experience has been that it may be half open. I continued to operate the valve, erroneously thinking I was opening and closing it. 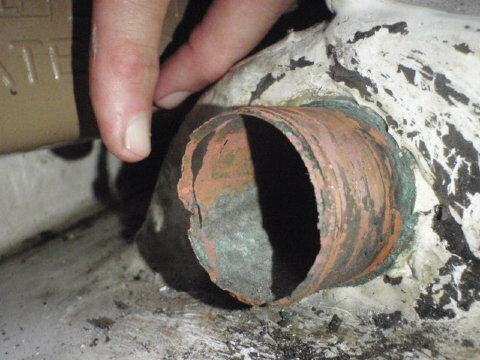 Note that the valve body is unplated, indicative of bronze or DZR. Corrosion of the other side of the ball.